Kosher Info: Your choice of eating kosher in Cancun (unless you are staying in one of the kosher resorts over Passover) is either ordering catered meals from Chabad or bringing your own food (though no beef or fresh produce allowed into Mexico), which you can supplement by a variety of kosher products found in local stores. Chabad lists what you can spot in Walmart, Sam’s Club and Costco. In addition to the familiar US hashgachos, there are two Mexican ones – KMD and VK Alef Alef – to look out for. For example, LALA milk (not Chalav Israel) with VK Alef Alef is easily found everywhere. On our trip to Walmart we also discovered yummy LALA yogurts and another brand with KMD hechsher (very cheap too, they were at about $0.25! ), as well as cream cheese, lox, tofu, canned goods, cereals, ice cream, and lots of snacks. 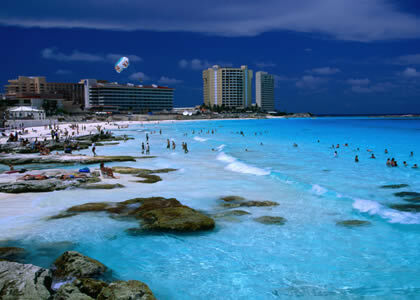 Tourist Info: Cancun is a perfect sunny destination if you want to combine beach and poolside activities with sightseeing and other experiences. Cancun offers an abundance of the latter, with trips and activities sold everywhere from your hotel lobby to a mall or a street kiosk. You can choose from a variety of theme/eco-parks (Xcaret, Xplor, Xel-Ha), ancient Mayan ruins (most famous being Chichen Itza), dolphin swim programs, all-terrain vehicles jungle tours, and a number of sports and aquatic activities from zip-lining to parasailing to scuba diving, and more. If you are not an adventurous type you may choose to see the colorful marine life from the glass-bottom boat or in the aquarium. You have to travel 1-2 hours to some sites, while others are local. 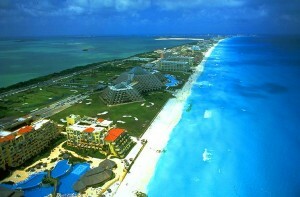 Or… you may skip all of it and simply enjoy the turquoise waters, white sand and the luxuries offered by your resort. Be aware, however, that many beach areas in Cancun are notorious for rough seas – during our weeklong visit in February the waves were pretty high and the red flag was raised most of the time. On our visit we selected 2 day trips. One – to the beautiful island of Isla Mujeres (a 40-minute ferry ride from Cancun), where we participated in the Dolphin Encounter program at Dolphin Discovery, and later took a golf cart tour from the downtown across the island and back. Meeting and touching a dolphin was the highlight of the whole trip for our 3-year-old son. The second trip was to the eco-park Xcaret (1.5-hour bus drive away) where you fill your day with various water activities, nature encounters, and cultural explorations, all culminating in a 2-hour-long spectacular night show, which unveils Mexican history and culture through dance and music. We also visited a small aquarium in the La Isla Shopping Village (short walk from the hotel we stayed at), which had an evening dolphin show; browsed through the pleasant La Isla mall itself, and undertook a disappointing trip to the flea market (Market 28) in the mainland Cancun. We did not explore the downtown area, but some tourists were heading there. 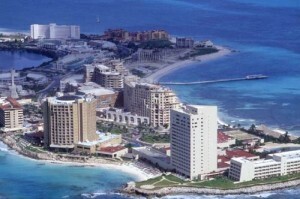 Cancun is composed of the city itself, where locals live, and the long strip of land (island, in fact) between the coastline and the Nichupte lagoon, called the Hotel Zone. 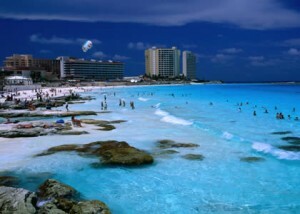 Compared to the shiny tourist zone, the authentic Cancun was a rather unattractive sight to our taste. Buses run regularly along the Boulevard Kukulcan in the Hotel Zone and to the downtown area, making it very convenient and inexpensive to get around, while taxis are quite pricey. If you are traveling with a small child, pick him up when entering the bus – if the child walks in by himself, you pay the fare for him due to the funny automated system counting the number of feet. Also, sometimes you have to flag the bus in order for it to stop, especially in the evening. There is a number of shopping plazas and convenience stores along the Hotel Zone, where you can exchange money, and buy various necessities, as well as engage in more serious shopping. You can buy Mexican souvenirs and apparel in many places along the Hotel Zone, but you can supposedly bargain at Market 28. Beware of the timeshare sales presentations pushed everywhere – we were dragged into one right in the airport upon arrival. (To tell the truth, we were ready to sign up to one in exchange for huge sightseeing discounts, but it was surprising anyway that such presentations were offered at an airport booth, and unsuspecting visitors were somehow channeled to those booths which seemed to provide only tourist info). Cancun is all about luring tourists into spending more money, be it a sightseeing tour offered by your airport transfer company rep, or a sunblock sold on the tour bus, so make wise choices and don’t hold a grudge, as many locals depend on the tourist industry to make their living. Jewish Info: When we came for the timeshare presentation, they changed our salesperson at the last moment. Perhaps, a manager saw us, who knew what a kippah on my husband’s head means. The first thing the new (very Mexican-looking) salesperson did was taking a kippah out of his pocket and confiding to us that his last name is Cohen, but they don’t let him wear kippah at work, and later producing his ID as a proof. According to him, there are lots of Jews in Cancun, which we understood to be mostly unaffiliated or traditional, and some organized Jewish community in downtown Cancun with no rabbi of their own. As nice as our salesperson was, we did not buy the timeshare. The Orthodox community is represented by Chabad of Cancun with its enthusiastic Rabbi Mendel Druk and his lovely wife Rachel. They run a number of programs, hold services and host Shabbat at their Chabad House in downtown. Twice per month they hold Shabbat services and Kiddish dinner and lunch at Avalon Grand Hotel in the Hotel Zone. They also organize Jewish holiday celebrations and cater to various other Jewish needs both of locals and tourists. We tremendously enjoyed meeting this couple so dedicated to bringing Yidishkeit to as many Jews as possible. Please contact Rabbi Druk directly for any questions.